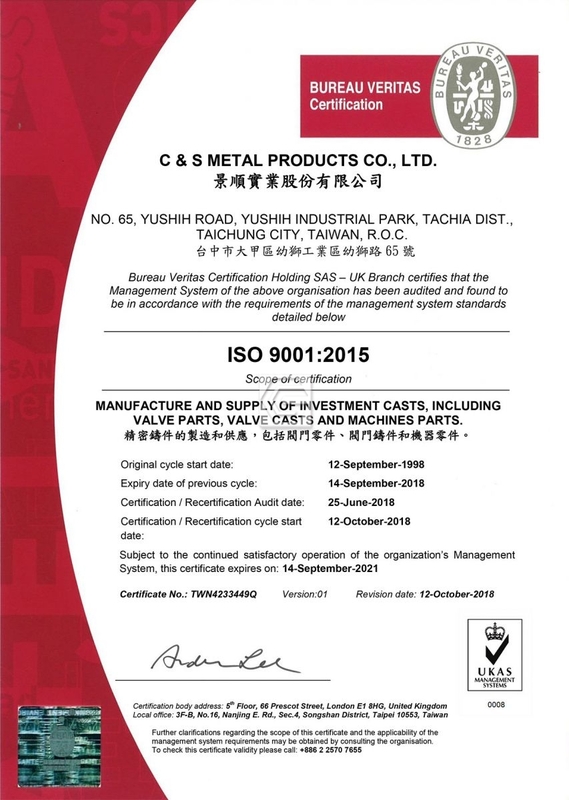 C & S metal products Co. Ltd. is an ISO 9001:2008 certified manufacturer. We have built quality control procedures into the production process at every stage, to control the casting qualities. We guarantee the chemical compositions and physical mechanical properties of the castings are qualified. These tests are according to the specifications of ASTM A216, A351 and DIN 17245,17445 etc., and we provide the testing certificate DIN EN 10204 3.1B. You can get more information about investment casting, lost wax casting and alloy steel investment casting process. Operation spec: ASTM A216, A351, DIN 17245,17445, etc. Each melt, melt composition sampler verify. Improve success rate on the first casting poured. Operation spec: DIN 50125, 50145 and ASTM. 3D dimensional measuring systemequip with optical lens. Operation spec: DIN 50351 and ASTM.